Please note: The coin number you receive will differ from the photo. This coin weighs half a kilo (500 grams)! Thats over 1.1 pounds! 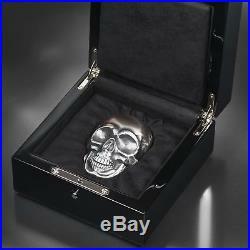 Following the overall surge in popularity in skull designs and the huge success of the Skull No. 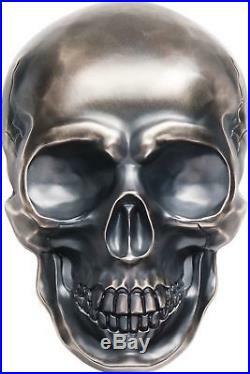 1 coin and its small gold equivalent, CIT proudly introduces additional coin skulls in 2017. Headlining the new releases is undoubtedly the Big Skull. 1 that becomes even more astounding on its hefty half-kilo big brother that ships in a luxurious collectors box and is limited to 555 pieces. 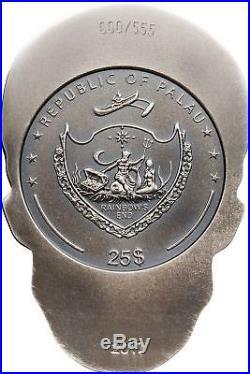 The obverse displays the Palau crest. 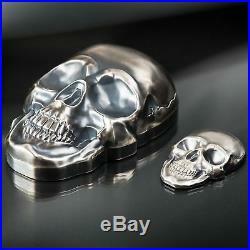 The reverse is shaped like a pirate skull in high relief with an antiqued finish. The total mintage is just 555 coins. 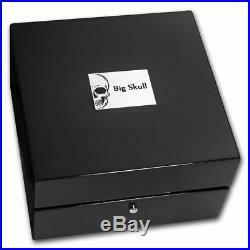 The original mint box, Big Skull branded gloves, and certificate of authenticity are included. Please be sure your address is correct before paying for the invoice.